The animated film The Blue Pyramid was created in 2016 by Polina Kornyushenko, a 17-year-old pupil of Dnipropetrovsk Regional Children and Youth Film Center “Vesnyanka” which is a communal out-of-school educational institution of the Dnipro Regional Council (headed by Koltsov S.M). This movie, based on the story of a cult American humanist writer Ray Douglas Bradbury, raises the theme of special children and loved ones who care for them. It is about the unconditional love of parents and their ability to sacrifice for the sake of being close to their child. It is usually believed that an animated film is a cheerful and funny show. But in this range it is possible to create even serious plots. The Blue Pyramid participated in many festivals of different levels. At which it has been repeatedly awarded diplomas and awards. 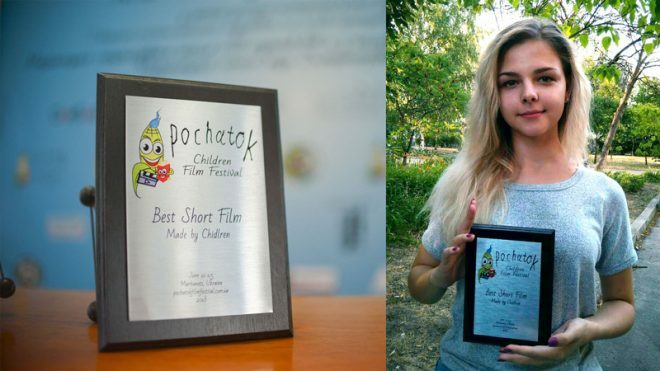 Among them is the 1st degree diploma of the International Orthodox Cinema Festival “Pokrov” (Kiev), the 1st place in children’s animation creativity competition in the International Animated Film Festival “Animaevka” (Mohyliv, Belarus), the diploma of the winner of the Children’s TV Festival “Turn on!” Moscow, Russia), etc. However, the rewards are not important to the author. The most important thing is that viewers do not remain indifferent, they sympathize with the heroes of the film. Just such an audience was at the Pochatok Film Festival. We are happy because both the viewers and the jury liked our film and competing with other very entertaining films it received a high award. Thanks for the spectators, juries and organizers of the festival who invited us to participate. Written by Svetlana Koltsova, Artistic Director of Youth Film Center “Vesnyanka”. Translated from Ukrainian by Svitlana Medvedeva.